Project partner: Tunisian Institute for Cultural Heritage (INP), Rhenish State Museum Bonn, MARE Oxford et al. Hellenkemper Salies, G.; Prittzwitz und Gaffron, H.-H.; Bauchhenß, G. (Hrsg.). Das Wrack. Der antike Schiffsfund von Mahdia. Katalog des Rheinischen Landesmuseums Bonn, 2 Bd. Köln 1994. Hellenkemper-Salies, G. u.a. Neue Forschungen zum Schiffsfund von Mahdia. Sonderdruck aus Bonner Jahrbücher 196, 1996. The wreck of a Roman freighter laden with Greek art treasures. The history of its salvage, research and the results. 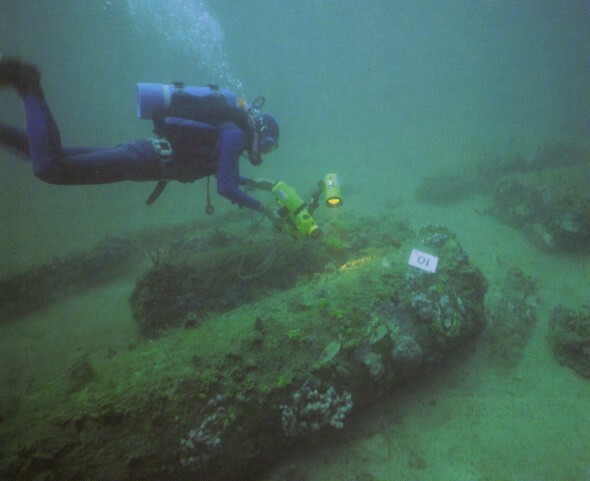 Underwater archaeology sets off with a chance find. It were sponge divers from the Dodecanese Islands, who made at the beginning of the 20th century the hitherto most important discovery of 1st century B.C. shipwrecks. In 1900, Syme sponge divers, equipped with helmet diving suits, discovered on their return from the rich Tunisian fishing grounds, off the eastern coast of the island Antikythera, a shipwreck laden with art treasures. Its ensuing salvage through the Greek Department of Antiquities of the National Museum in Athens produced unique sculptures of bronze and marble. Few years later, in 1907, Greek fishermen, on their search for the much sought-after sponges, discovered 5 km off the Tunisian coast near Cape Africa at Mahdia in a depth of 40 metres a sunken, precious, ancient cargo, which valuable works of bronze promised a much higher sales value than laboriously collected sponges. Soon the Department of Antiquities in Tunis became aware of the finding of the rare and precious artefacts. Under the scholarly supervision of the director of the Tunisian Department of Antiquities Alfred Merlin, Greek divers started a systematic salvage of the site and thereby pioneered in underwater archaeology. Until 1913, after several campaigns, the wreck has yielded sensational works of art of diverse forms and parts of the ship's equipment, which were brought to the Bardo Museum in Tunis for restoration and storage. They were published by Merlin. The publications of the finds ignited a broad scholarly discussion in the ensuing years. The wreck itself lost its official interest. Not before 1949 a group of French navy divers under the leadership of Philippe Tailliez and Jacques-Yves Cousteau with their new self-contained breathing apparata became interested in the Mahdia wreck and its treasures (later also in Antikythera). Within the context of a "training programme" they recovered a number of artefacts from the seabed within a few days, which whereabouts are largely unknown today. A scholarly investigation of the wrecksite was conducted in 1954 and 1955 by the Club de Recherches Sous-Marine de Tunisian under the direction of the French engineer Guy de Frondeville - for the first time precise measurements for a site plan were taken, which allows conclusions on the sunken ship itself and the stowing of cargo. On the basis of the results of this investigation, Frondeville assumes that all valuable remains of the cargo have been already salvaged. In 1987, more than 30 years later, the endangered survival of bronze works of art in the Bardo Museum prompted a Tunisian-German Mahdia project, launched in collaboration between the Institut National du Patrimoine (National Institute of Heritage), Tunis and the Rheinisches Landesmuseum (Rhenish State Museum), Bonn with the aim of restoration and scholarly re-evaluation of the find-complex. Owing to generous financial support by German foundations and international friends and patrons, Rhenish State Museum's staff succeeded with remarkable commitment under the charge of the late Gisela Hellenkemper-Salies to conclude in September 1994 the restoration and conservation work of the largest part of the museum's finds from the Mahdia wreck according to the most recent scientific standards. The finds were presented in the following months until February 1995 to international experts and the wider public in a large-scaled exhibition. The research results of seven years with almost 100 contributions of experts were collected in a two-volume catalogue and put up for discussion. Two international colloquia on this basis, held in Bonn, generated further knowledge on culture and art history of the ship and its cargo, its origin, voyage and sinking. Hence it is not surprising that the UNESCO acknowledged this Tunisian-German Mahdia project officially as activity with the objective to "bring diverse cultures closer together, to generate mutual appreciation and respect to preserve valuable cultural heritage and to promote peace by means of international cultural cooperation". On the initiative of the Rheinisches Landesmuseum Bonn (Rhenish State Museum Bonn) the underwater archaeological unit of the Tunesian Institut National du Patrimoine (Institute of National Heritage) and the Deutsche Gesellschaft zur Förderung der Unterwasserarchäologie (DEGUWA) (German Society for the Promotion of Underwater Archaeology) began in 1993 to document and evaluate the present state of the wrecksite by cartographic and photographic means as well as by video recording. In comparison to de Frondeville's site plan it was possible to establish that objects have become dislocated and that the condition of the ship timbers has increasingly worsened. The material loss incurred by the sinking of the ship and its cargo must have been ruinous for its owners. A projection of the cargo value suggest a sum of over one million sesterces. It encompassed a multitude of architectural elements, such as 60 - 70 pillar shafts, gigantic marble kraters and candelabras, domestic luxury furniture, bronze and marble statues and statuettes, reliefs, inscriptions and much more. The stylistic assessment as well as the scientific and technical analyses of the finds have yielded that the cargo encompassed not only objects from one epoch, but that artefact of several centuries were shipped together and that the sinking of the art shipment can be dated to the first half of the 1st century B.C. The art historical classification of the artefacts through secured comparative objects suggests that the largest part of the cargo originated from Athens and Attica and was manufactured in a period from between 350 to 50 B.C. Therefore the cargo consisted of new commodities as well as "antiques". This fact induced former researchers of this find complex to assume that Pireaus was the freighter's harbour of departure. The immediate occasion of the shipment of these art works was associated to spoils made in the course of the conquest and plundering of Athens in 86 B.C. through Sulla - an event cited in classical manuscripts. But the Bonn examination of the pottery from the ship as well as a recent stylistic assessment of single objects yielded that they were manufactured at least 20-30 years after the Sullanic catastrophe. Hence there must be a different cause for this precious shipment. The answer to this question lies arguably in a contemplation on the destination port of this ship and the consignee of this cargo. The heterogeneity of the cargo, which encompassed architectural elements, domestic luxury furnishing and art from diverse epochs, which had been already displayed at public spaces and sanctuaries, as well as a series of newly manufactured ostentatious objects, suggest that the consignee of the cargo was a member of the upper class. Any such class could only be found in the centre of the ancient world: in Rome and Campania. The interest of the Late-Republican upper class of the last century B.C. in Greek art is supported by frequent references in written sources on art trade and looting. In this time the Roman nobility derived pleasure from the life-style of Hellenistic rulers and sought to surround itself with the appropriate ambience in the luxurious villas of Campania. 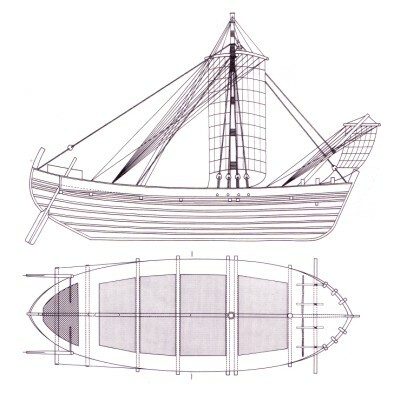 Also assumptions on the construction of the freighter indicate a destination port at the coast of Campania. The analyses of the wood samples, the caulking material and parts of the ship equipment suggest that this vessel was built in this region too and that its owner dwelled there. Judging from the current level of knowledge, it seems likely that the Mahdia wreck was a art transporter, which carried this precious cargo either as a commissioned or freelance merchantman from Athens in the direction of Rome and sunk for unknown reasons off Cape Africa. The fact that this ship was driven on to the Tunisian coast could be explained by nautical considerations of the meteorological conditions and technical aspects of seafaring in those days, as thoroughly discussed in Bonn. Despite of the varied new and important discoveries produced by the Tunisian-German research project on the Mahdia wreck, some questions remain unanswered. Particularly questions regarding the construction of the solidly built hull have to be studied. The recovery and conservation of the surviving timbers would give further insights, which is being considered on the Tunisian part. Perhaps the imminent reopening of the Mahdia Wreck exhibition halls in the Bardo Museum by the Tunisian president will provide an occasion for obtaining funding. This article was published in Greek in: I Kathemerini. Epta Imeres. Athens. 03.09.2000.